A few days ago, we were up surveying the garden (my lettuce is doing quite well! yum!). Our neighbor pointed out that the black raspberries are starting to ripen, so we pick a couple of handfuls. 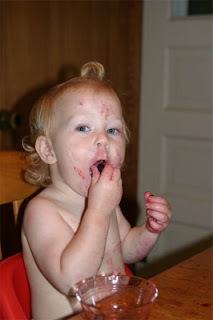 Elizabeth had never tried raspberries, so I offered one. At first, she plainly refused. Once she saw that Jude and I were eating them, she became much more interested. She tried one, and then she kept coming back for more. Eventually the mosquitos chased us away, but we made off with half a pint or so of fresh raspberries.